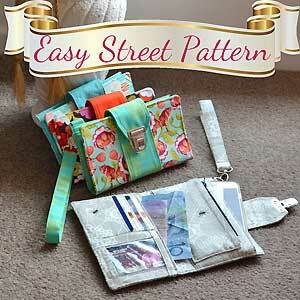 Brandt's Boulevard Bag Pattern by ChrisW Designs is easy to make and has lots of compartments to keep you organized! This line of bags can be made and sold online. 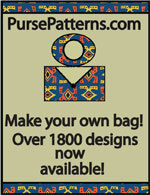 The Brandt's Boulevard bag pattern by Chris W Designs is an easy and quick pattern that can be made over the weekend or even in a day! This handy bag has instructions for an ID pocket, 4 credit card slots, a zippered coin section, a slip pocket (perfect for bills or your lists! 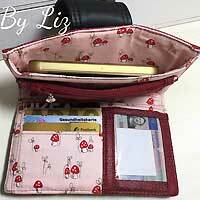 ), an additional smaller slip pocket and a phone slip pocket that works well with your iPhone 6! Also included are instructions for an optional wrist strap. 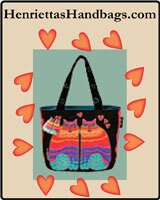 Make one for yourself or even make and sell this bag online or at craft fairs! 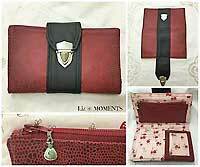 This bag is approximately 18.4cm W X 10.8cm H X 2.2cm D (7 ¼” W X 4 1/4” H X 7/8” D) when closed. The Brandt's Boulevard pattern has a total of 18 pages. There are 16 pages of precise instructions which include 45 step by step color photos and a one page pattern piece. There are also printing instructions and even test squares to make sure your bag is printing out correctly!